At Restore SD Plastic Surgery, we are here to help you improve your skin fitness through medical-grade services. 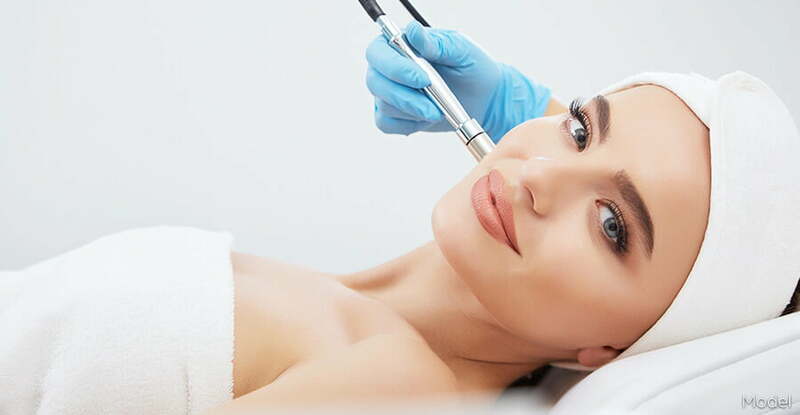 We offer microneedling, medical-grade facial treatments, microdermabrasion, chemical peels, and many other popular forms of skin care treatments and products. Every patient benefits from a complimentary Restore SD skin assessment with attention to each patient’s unique skin characteristics and goals for treatment. Allow our Restore SD expert evaluate your skin and advise the proper skin care regimen to recapture the youthful look with which you were born. From deep cleaning, pore refining treatments to intense moisturizing therapies, anti-aging peels and microneedling, we invite you to experience healthy skin…. for life. DermalInfusion, previously known as Silk Peel, is an advanced skin-resurfacing treatment that combines exfoliation, extraction, and infusion of condition-specific serums to improve skin health, function and appearance. Facials can address a wide variety of needs ranging from premature aging and environmental damage to acne flare-ups or a dull and patchy complexion. These tailored treatments can cater to all skin types and may include deep cleansing, extractions, exfoliation, or the highly effective rejuvenation of medical grade peels to achieve a radiant glow. We offer a variety of customized facials, including Age Defying, Hydrating, Deep Pore Cleansing and Teen. We offer a wide range of Chemical Peels for all skin types and conditions. Helping to dissolve away the dead skin cells, your peel will leave behind more balanced and refined skin. Depending on the strength, some peels will result in a small amount of downtime, during which the dead skin will visibly flake and peel off. Following this stage, the “new” skin will appear smoother and more even in texture and tone. These peels will help with acne, acne scars, fine lines and wrinkles, blotchy, uneven pigmentation, as well as stimulate new cell growth. Areas of sun damage, which may contain precancerous keratosis that appear as scaly spots, may improve after peeling making them less likely to reappear. The Stimulation Peels uses exfoliants, retinol, and other agents to improve skin health and treat many of the signs of aging. This peel improves dull skin, rough skin, acne, sun damage, melasma, enlarged pores, and fine lines. The treatment provides antioxidant protection and anti-inflammatory benefits. This peel is suitable for all skin types and is followed by an at-home plan the products longer lasting results than traditional peels. Precision is a booster to be used together with the VI Peel. It is formulated with the same synergistic blend of ingredients as VI Peel but at a higher concentration. For when your peel needs that extra boost! Hyperpigmentation is a condition when patches of skin become darker than the surrounding skin. Although it is usually harmless, it can be difficult to treat effectively. The VI Peel Precision Plus can help restore the skin tone you deserve.